Dog training reward programs are one of the oldest methods of training dogs, dating back to the days when people started trying to domesticate wild animals. 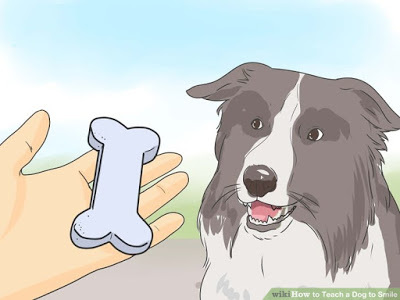 It is probably the method of dog training that most of us are familiar with and involves rewarding the dog for performing a task we have asked of them. Success helps build confidence in the dog and a confident dog will develop into a loyal pet far quicker than one that is unhappy and miserable, or one that is always scolded whenever s/he does not do what has been asked of them. Some people prefer to use reward training plus the leash and collar to get the best out of their dog. This is worth a try as some dogs respond better to reward training than leash and collar training, and vice versa. So, deciding on which method to use depends on which method gains the most response from your dog. Reward training has increased in popularity over recent years, with many people finding this their preferred method of training. Training puppies is easier than training an adult dog because a puppy is free from bad habits. Training older dogs is possible, although it may take longer. Also, certain breeds are easier to train as some species have an aptitude for learning while others dislike the training sessions. Ultimately, there is no definitive answer for the best way to train a dog, as some dogs respond better to one technique than others. Trial and error will show what is right for you and your dog. Practicing reward training and then switching to a collar and leash training will show you how the dog performs with each method and it may take several sessions of training before you review the progress made. Advanced techniques exist that go beyond the basic commands and many dog training schools teach these. Sometimes, it is faster and easier to train your dog as part of a group than going it alone, as this option provides your pet with social interaction that is known to aid in learning. It will meet other dogs and you will meet other dog owners. This is beneficial as talking over training and behavioural issues often resolves problems. Most dogs will respond to either method of training, and any training is certainly better than none. Teaching your dog a few basic commands is preferable to teaching nothing, while remembering that untrained dogs are not welcomed and often become a nuisance to neighbours. Reward training is even used for dogs that work in the military and police and other law enforcement agencies. Dogs used for scent detection and tracking are often trained using some form of reward training. Home-made dog treats are perfect for reward training and giving your pet a treat is the best way of showing your devotion to him. Additionally, Home-made dog food ensures that you feed your pet a wholesome diet instead of branded foods which are often full of additives, fillers and preservatives, which are often the cause of various health issues your dog might suffer in future. Making your dog’s foods and treats yourself means your dog avoids eating these unhealthy substances and stays as healthy as possible. By eating a nutrient-rich diet, your dog will stay smart and alert and respond quickly to the training commands. Good food and training work well together, and so will you and your dog.